The first chapter of a very uncompleted horror game made for the January 2017 MAGS contest. Very rough around the edges, and I hope I can get it finished soon because I love the story and feel of the game. I was hoping to get a bit more done but ran into some issues that took hours to fix. I hope that at the least this might be an intriguing glimpse of what might become a decent horror game. Obviously this game is not finished yet, but what is here has a good atmosphere and the beginnings of an interesting story. 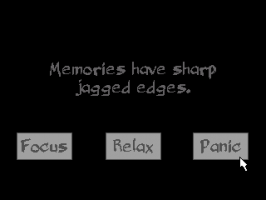 The puzzles still need some work, but there is plenty of potential for an eerie and chilling game.